- Phil is being overly fussy with Helen. - Karl tells Marlene that the pain-relieving injection he administered may have killed Cheryl. - Sarah discovers that Danni's designs have been unpicked. Phil keeps offering to do things for Helen, but she says she can cope with them herself. She tells Phil that she was daydreaming and imagined that she could hear Harold and Jim talking in the kitchen. Phil looks a bit concerned. HELEN: It was only a daydream, Philip! It doesn't mean I'm losing my marbles. Phil doesn't seem convinced and tries to ship Helen off to bed but Helen wants to stay up until Debbie gets in. Helen isn't impressed that Phil hasn't gone to pick her up from the airport, but apparently Debbie was determined to make her own way home. Helen struggles with her cup of hot chocolate, and Phil keeps trying to help. Helen tells him she has to learn how to do things herself, but he thinks she needs to do everything one step at a time. Sarah and Cath are hard at work fixing Danni's clothes. Danni pops in - she saw the lights on as she was walking home from the pub. Sarah tells her that her clothes have been unstitched. Danni is in shock. Cath tells her that they can all be fixed. Danni is determined to find out who is responsible, but Sarah tells her that the main priority is to get the clothes fixed - and quickly. DANNI: What's the hurry? Can't it wait until tomorrow? SARAH: Graham Williams is coming over the day after tomorrow. CATH: He's the guy doing the 50s to 90s fashion parade. DANNI: Yeah, I know who he is. What's he doing coming here? SARAH: He wants to take a look at some of your designs and if he likes them he MIGHT put them on display. Apparently Graham is an old friend of Sarah's and she put a word in for Danni this afternoon. Danni's a bit despondent because all of her new designs are now in pieces. Cath suggests they should give it a miss, but Danni gets spurred on and says that it's a chance of the lifetime. 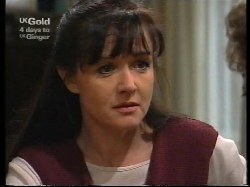 Phil and Helen tell Debbie about Cheryl's death. They say that they didn't want to ring her in Perth so they waited for her to come home. Debbie is stunned and asks about Danni. Helen says she's handling it surprisingly well, but Phil's not convinced - he thinks it hasn't sunk in. 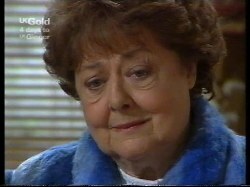 Debbie grabs her coat and says that she has to go and offer her condolences. Helen tries to talk her out of it, saying that she may have gone to bed. Debbie says that Danni never goes to bed early. Helen looks surprised - she was talking about her waking Marlene. Debbie rushes out of the door. Phil looks a bit surprised. Danni thanks Sarah and Cath for their help - with running Chez Chez, she wouldn't have noticed until it was too late. Cath says they only noticed because they were trying stuff on so they could do a fashion parade for Graham and it started to fall apart. Sarah says they think they got to most of it before it was sold - apart from Luke's shirt, which he wore to a job interview and it fell apart! Debbie walks into the shop and Danni snaps that she thought she was on the other side of the country. Debbie tells her that she just got back and as she wasn't at home or in the pub, this was the last place she could think of. Danni says she's not in the mood for a fight. DEBBIE: I just wanted to say how sorry I was. DANNI: Why? What did you do? DEBBIE: About your mother. I couldn't believe it when I heard. I still can't. I know from experience how you must be feeling and I'm really sorry. Debbie comments on the fact that they're all working and Cath introduces Sarah and Debbie to each other. Debbie offers to help them and Danni gives her a pile of clothes to sort through. DANNI: What happened to you in Perth? DEBBIE: What? What do you mean? DANNI: I can't believe you're the same person. DEBBIE: Oh. Yeah. I had a chance to think about things and I should never have let myself get so worked up over you and Luke. I'd like to pretend it never happened, if you could? DANNI: Yeah, I can pretend anything that helps us get these fixed. Susan has popped over to see Marlene and is worried that she might have had second thoughts about blaming Karl, in light of Darren's attitude. Marlene says that she doesn't blame Karl - and Darren will come around. Susan wishes she could get Karl to understand that there's no way he could've known that Cheryl was seeing another doctor and had been prescribed medicine. Marlene says it's funny how things work out - if Karl and Cheryl hadn't been at loggerheads over Libby and Darren, Cheryl would've gone to see Karl and he'd have known what medication she was on. Susan says it doesn't help to play the "what if" game - but she's home all day if Marlene wants anything. Phil answers the door to Ruth Wilkinson - Helen's physiotherapist. Ruth tells Helen about a Chinese proverb - every thousand mile journey starts with a single step. Phil says he agrees and he's been telling Helen that she has to take it easy. Ruth says it needs to be a balance - she can't overdo or underdo things. Phil goes off to get a chair and Ruth explains that she wants Helen to do a few simple tests - nothing painful or difficult. Phil brings the chair in and tries to mollycoddle Helen, which she gets quite annoyed with. Ruth interjects and tells Phil that family members - with the best of intentions - can slow down the recovery process by being overprotective. Ruth wants Helen to be as independent as possible. Phil is clearly not happy, but Helen is really pleased! Marlene comments that Danni doesn't seem to have had much sleep. Danni says she was working in the shop until midnight and is going back - she just wanted to see if Marlene needed anything. Marlene is fretting about hearing back from Lou - she wants the service to be right. Danni says she couldn't sleep because if she'd known that Cheryl had seen another doctor, she might not have died. Danni tells Marlene that Karl asked her if Cheryl was on any other medication and all she did was yell at him to help Cheryl. Marlene insists it was a terrible accident - and allocating blame only makes it more painful for everyone concerned. Ruth's physio tests are under way and Ruth asks Helen to stand without using her hands for support. Phil doesn't think it's a good idea and as she starts to stand, warns her that she might fall! Ruth looks annoyed and exasperated in equal measure. She suggests that Phil should leave, but he isn't keen, so she insists he leave. He does, but he's not happy about it. Ruth tells Helen that they've got a lot of hard work ahead of them. Helen says she can't help but wonder if it's going to do any good. Ruth says it's going to be hard work - and Helen has to do it herself - but they will get there. Helen is pleased that someone thinks she's capable of doing things! Marlene has popped over to see Susan. She apologises for taking her up on her offer so soon, but she's worried that she might be partly responsible for Cheryl's death. Marlene explains that a few months ago, she found out that Cheryl was on a mild anti-depressant that Karl had prescribed and she told her to pull herself together and get on with her life. Marlene is worried that if she'd been more sympathetic, Cheryl may have told her about the pills she got from the other doctor instead of keeping them a secret. Susan says that no-one should blame themselves - not Marlene and not Karl. Marlene says she understands what Karl's going through. Ruth and Helen have finished up and Phil has a chat with Ruth. He's concerned that Ruth doesn't understand how frail Helen is. Ruth basically tells him to stop hovering over Helen and to not knock her self confidence - and as she's done a detailed capability report, she's fully aware of what Helen can and cannot cope with. Phil goes to protest but Ruth insists that she knows what she's doing. Phil is quite irritated and yells to Helen that he's going out to see someone. 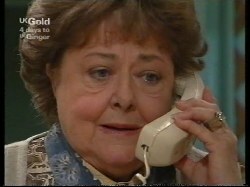 Ruth goes into the kitchen where Helen is and gives her her number. Ruth tells her that the next session will be where they really get started and she won't have a spare moment to feel sorry for herself! Helen thanks her for being frank and it's no fun being treated like a six year old - but she can't say anything as the family mean well. Ruth says she understands - that's why she said it for her! Phil goes over to see Karl - but he's not about. Phil tells Susan that he has reservations about Helen's new physio. He starts to rant, but then sees that Susan is distracted and apologises for coming over with his worries when Susan and Karl have got enough to deal with given what's happened with Cheryl. SUSAN: It's not that. ..... Yes, it is that. Susan tells him that she's really worried about how hard Karl has taken the Cheryl business. Phil offers a cup of tea and a chat with an old friend as a remedy - and Susan invites him into 28. 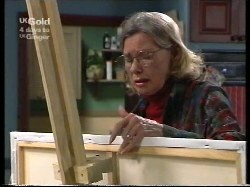 Helen is trying to set up an easel but is struggling badly. Danni, Cath, Sarah and Debbie are hard at it. Sarah says that if they don't stop for lunch soon, it'll be time for dinner but Cath reckons they have too much to do. Debbie tells them to go for lunch - she'll keep ploughing on. Danni gives her a very sceptical look. DEBBIE: What? You still think I've got some ulterior motive for being here? DANNI: ...I don't know, ok? And I don't really care. I need all the help I can get right now so if you're happy to help, it's fine. DEBBIE: Just think of it as something good happening to outweigh the bad, all right? Cath holds up a dress in the background and says that she thinks it seems ok. Debbie affirms that it's fine. Cath wonders how she knows. Debbie quickly backtracks and says that she's sure she checked earlier. Cath and Danni give her a funny look. Marlene is washing up. The phone rings. Marlene is told that Cheryl's autopsy results are ready for collection. Marlene asks if she can be told over the phone - the results are very important to a lot of people. MARLENE: Did she die from the accident or was it the injection that killed her? Helen is struggling with a paintbrush and drops it with the effort just as Phil comes in. He's gobsmacked that Helen's tried to paint and Helen gets very upset, saying that she's useless. PHIL: Helen, you are not useless. It's just too soon! You can't expect... I don't care what the physio says, you shouldn't try to push yourself beyond your capabilities. Helen insists it's not Ruth who's caused this - it's something she wanted to do for herself. She sobs. Phil is annoyed, and clearly blames Ruth for pushing the independence issue earlier. Helen is devastated about how she's going to spend the rest of her life, but Phil tells her that she will make a recovery. 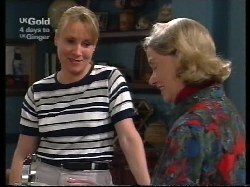 Marlene goes to see Susan with the results of the autopsy. MARLENE: The official cause of death was the injection but they said that... They said that her injuries from the accident were massive. That it's unlikely that she would've survived them. SUSAN: But we'll never know for sure? MARLENE: Well, I know. She was in terrible pain and Karl stopped her suffering. As far as I'm concerned, he did the very best he could for her and I'll always be grateful. And I'll tell him that as soon as I see him. SUSAN: That would mean a lot to him. Danni and Debbie are still ploughing on. Debbie suggests that Danni have a break if she needs one, but Danni says she just needs to stretch her legs. She comes over to where Debbie is working. DEBBIE: The main thing is nothing was beyond repair. Once we get these few finished, it'll be like it never happened. DANNI: No. Someone tried to wreck my business. No-one does that and gets away with it. DEBBIE: Can you hand me those red buttons? DANNI: If Catherine and Sarah hadn't spotted this in time, I'd have been laughed at in the street. Danni hands Debbie the buttons and then pauses. DANNI: ...how did you know it was those buttons? DEBBIE: ...um... I didn't *know*. I just... guessed! They look like they go with it. DANNI: Why not the green ones or the black ones? You knew it was those without even thinking about it. DANNI: Just like you knew which dresses had been damaged and which ones hadn't! ...there's only one way you could know something like that. DEBBIE: No, no. Danni, I didn't know, I just guessed! DANNI: I thought there was something suss! You suddenly being so helpful. Because it was you. You're the one who did all this!